this Q2 GDP report is as bad as it could be. I thus stick with my prediction that, by Q4, the growth rate will be close to zero and by early 2007 the U.S. will be in a recession. Panglossian optimists have been proven wrong again. They’d better start adjusting their wishful-thinking forecasts of H2 growth (still close to a 3% consensus) to a reality of an economy rapidly slipping into an [sic] nasty recession. In 2006 cash is king and all risky assets (equities, EM bonds, currencies and equities, commodities, credit risks and premia) will be battered once the markets finally comes [sic] to the realization that a U.S. recession followed by a serious global slowdown is coming. Finally the other delusion in the market is that, even if the U.S. were to slow down, the rest of the world (EU, Asia, China, Japan, Emerging Markets) will be able to “decouple” from the U.S. slowdown and keep on growing perkily…quite simply, when the U.S. sneezes the rest of the world gets the cold. The decoupling fairy tale will be proven as wrong as the U.S. soft landing Panglossian fairy tale. So Nouriel pretty much has all bases covered for anything that might go wrong anywhere in the world for the foreseeable future. Biosecurity Australia has been considering an application from The Philippines to export bananas to Australia since 2000 and made a draft recommendation two years ago that conditional permission be granted. The draft produced a storm of protest from growers and a senate inquiry, forcing the Government to send Biosecurity Australia back to the drawing board to prepare a further risk assessment next year. This week’s CPI shock is a nice case of protectionism coming back to bite the government in the arse. The saddest part is that the process itself is no longer mitigating that problem but compounding it. The World Trade Organization and its precursor, the General Agreement on Tariffs and Trade, were designed as a forum in which governments could demonstrate to their electorates that trade liberalization was a win-win game. Rather than convincing voters that lowering their own tariffs is good for them (as it is), the process relied on showing that other countries would lower their tariffs as well. The model was based on an exchange of “concessions”—trade reform as shared sacrifice. It was intellectually dishonest but, undeniably, it worked. In the decades after 1945, the world moved from comprehensively managed trade to a more liberal trading order, with fabulous economic results. Big exceptions remained—notably agriculture, ever the sticking point—but nobody was complaining. The system was apt to wobble from time to time, as you might expect, because it was based on a lie. But for a good few decades it effectively mobilized export interests against groups demanding protection, and the politics worked. Progress was slowing even before the Doha Round. But this week the “exchange of concessions” model finally fell in on itself. The WTO process is no longer assisting liberalization. It is blocking it and, worse, legitimizing the failure. The world has settled for less-than-liberal trade. It is a multitrillion-dollar error; a crime, truly, against the world’s poor; and, it seems, a story barely worth reporting. As an undergraduate, he had read Friedrich Hayek’s 1945 free-market manifesto, “The Use of Knowledge in Society,” which argues that a person’s knowledge is by definition partial, and that truth is established only when people pool their wisdom. Wales thought of the essay again in the nineteen-nineties, when he began reading about the open-source movement, a group of programmers who believed that software should be free and distributed in such a way that anyone could modify the code. The 1.6% quarterly and 4% through the year increase in the CPI in the June quarter will be seen cementing the case for an interest rate increase from the RBA next week. In reality, the headline June quarter inflation number will have little to do with the reason the RBA is likely to raise interest rates. Petrol and fruit prices together contributed one percentage point to the headline increase over the quarter, with a 250% Cyclone Larry-induced increase in banana prices the main culprit in higher fruit prices. Strip out volatile and non-market determined prices and the CPI rose a more subdued 0.6% q/q and 2% y/y. What is likely to concern the RBA is the firming trend in the various measures of underlying inflation, at a time when its medium-term inflation forecast is already near the top of its 2-3% target range. The continued run of strong activity data, including the probability the unemployment rate will post new near 30 year lows in the months ahead suggests further upside risks to the RBA’s inflation forecast. What should concern the RBA even more is that its inflation target appears to have lost credibility with the bond market. Yields on inflation-linked Treasury bonds have implied an inflation rate above 3% since December 2005, with the implied 10 year inflation rate having risen steadily from 1.9% back in June 2003 amid the global deflation scare of that year. With the exception of the uncertainties surrounding the introduction of the GST in 2000, this is the first time the implied inflation rate has been above the inflation target range since 1997.
the impact of demographic trends on macroeconomic factors relevant to financial markets, particularly saving and investment, capital flows and asset prices, as well as on the structure and operation of financial markets. The participants also placed considerable focus on policy issues, identifying the nature and extent of possible market imperfections and impediments, and the scope for policy-makers to address these. finds little evidence to suggest that financial markets will suffer abrupt declines when the baby boomers retire. In fact, in countries where stock market participation is greatest, including Australia, Canada, New Zealand, the UK and the US, evidence suggests that real financial asset prices may continue to rise as populations age, consistent with survey evidence that households continue to accumulate financial wealth well into old age and do little to run down their savings in retirement. [his] absence from politics for more than a decade has not lessened his passion to prune and fertilise our national landscape. As US inflation trends higher and global interest rates continue to rise, the dollar will be supported. The nominal short-term cash premium of the USD has reached 2.7%, and is still rising. We have long warned about the impact of the upside surprise in US inflation on the dollar and how it could alter our currency forecasts. We now believe that the cyclical dollar correction we had expected to take place in 2H this year may be further postponed to 4Q this year. the presence of negative dollar risk premiums (i.e. expectations of a dollar depreciation net of interest rate effects) amid record capital inflows could suggest that investors may favor U.S. assets for structural reasons. One possible explanation could be that the Asian crisis created a large pool of savings searching for relatively riskless investment opportunities, which were provided by deep, liquid, and innovative U.S. financial markets with robust investor protection. Moreover, the continued attractiveness of U.S. financial markets to European investors suggests that they offer a large array of assets, with different risk/return characteristics, that facilitate the structuring of diversified investment portfolios. Looking forward, this suggests that the allocative efficiency of U.S. financial markets could mitigate risks of a disorderly unwinding of global current account imbalances. The implied probability of a 25 bp tightening in the official cash rate to 6.00% at the RBA’s August meeting has firmed in the wake of last week’s strong June employment report, peaking at just over 80%, based on the August 30-day interbank futures contract. Given that there are many signs the U.S. economy has already been slowing, such a surge in oil prices might well be enough to push the economy into a recession. There is significant historical precedent. The 1956 war in Egypt shut the Suez Canal to oil tankers. Oil producers cut output by 1.7 million barrels a day, roughly a 10 percent decrease in world oil production. Prices surged, and by August 1957, we were formally in a recession. The outbreak of the Iran-Iraq war in 1980 caused world oil production to drop 7.2 percent. By July 1981, there was a recession. Iraq invaded Kuwait in 1990, and the same pattern held. With that likelihood, expect the normal “flight-to-safety” assets to rally if full-scale war erupts. Gold prices would head way up, interest rates on government securities way down. During the 1982 Lebanon War, the 10-year Treasury bill rate dropped 12 percent in the 11 weeks from just before war began in early June to Aug. 24, 1982, the day after the PLO agreed to withdraw its forces. The stock market would also take a big hit, history shows. During the course of the Suez Crisis in 1956, the Standard & Poor’s 500 Index dropped 5 percent. Angelina Jolie is said to be sold on playing Dagny. acknowledging uncertainty doesn’t play well with the media or the market. Today, the Fed’s actions are subject to constant press scrutiny. And it’s easier to lure audiences by using labels like “hawk” and “dove” than by exploring the subtleties of forecasting an uncertain future. In theory, investors should look past the headlines to the substance, but if the multitudes are treating the headlines as important news it’s hard for any individual investor not to do likewise. Since the beginning of Mr. Bernanke’s term, the Fed has responded by raising the funds rate by 75 basis points—to 5.25% from 4.5%, which is the neutral rate according to the St. Louis Fed’s version of the “Taylor rule.” This rise appears to be more than the increase in inflation since the start of his term; so, thus far, the Bernanke Fed is following a key principle of monetary success. There is likely to be some more work to do, however. If the inflation rate of personal consumption expenditures (PCE) continues at the 3.3% pace of the past 12 months, then a funds rate of 6.5% will be needed. Oddly enough, Taylor opposes formal inflation targeting, even though an inflation target is implicit in his Taylor rule. The extraordinary thing about the Costello challenge is that there is absolutely no rationale for it beyond Costello’s petulant self-regard. There is no policy or political imperative for Costello to go forward. This challenge is about Costello, not about the Australian people. As Treasurer, Costello has been a lukewarm reformer at best. For years Costello was the last socialist politician defending Australia’s absurd, incentive-sapping top marginal tax rate. After a decade he managed to reduce it by 2 per cent. Peter Costello entered parliament amid the purge of the Victorian Liberal Party’s Deakinite left in the late 1980s. It is not a little ironic that Costello now appeals mainly to the left of the party room, who are the least troubled by his lack of policy substance. Howard’s mix of populist conservatism and big-spending government has been a electoral winner - something free traders lament on both counts, but social liberals on only one. The danger for the Liberals is not the loss of Deakinites, it is the loss of the conservative working class if Costello takes over. Those who saw the Prime Minister yesterday being mobbed by teenage girls shouting ‘You’re so cool!’ will appreciate why the Treasurer is so reliant on an archaeological dig in Ian McLachlan’s wallet to stake his claim. Can a prediction market fail to predict even the past? One of the more vexed issues for prediction markets is defining the terms of their contracts. Intrade’s North Korean missile launch contract has continued to trade, because the US DoD has not officially confirmed that the missiles left North Korean airspace (12 nautical miles from the coast), as per the terms of the contract. 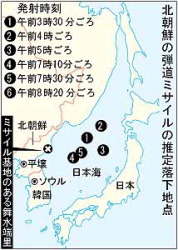 NorCom will only say the missiles landed in the Sea of Japan. In absence of such confirmation, Intrade will expire the contract at zero, even if more missiles are launched. The price action in the contract thus probably tells us more about the confusion over the terms of the contract and the willingness of the DoD to divulge additional information than it does about the prospects for missile launches. It also provides a nice illustration of the role of asymmetrical information in markets, given the willingness of some to short the contract in the immediate aftermath of the missile launches, with volume exceeding what would be expected from the squaring up of long positions placed in advance of the launches. See the discussion at the TEN Forum (via Chris Masse). The Exchange confirms that it has sought direct confirmation from the US Department of Defense regarding the above contract. As of today’s date no such confirmation has been received. As is standard operating procedure to ensure orderly operation and expiry of all markets, the Exchange is and will remain proactive in looking for verifiable settlement related information from the relevant authority. The Exchange will not use third party non-verifiable confirmations for settlement of any contract. Your mortgage may soon be in the hands of a guitar-playing amateur pilot from Sylvania Waters. Glenn Stevens is likely to enjoy a much smoother transition than Ben Bernanke. An incredible amount of nonsense was written about Bernanke as he moved into his role as Fed Chairman and markets are probably still less than fully sold on his inflation-fighting credentials. This is a reflection of the weakness of the institutional framework for monetary policy in the US and Alan Greenspan’s promotion of a highly discretionary approach to policy he euphemistically termed ‘risk management.’ It is hardly surprising then that markets view the Fed’s inflation-fighting credentials as being only as good as the next Fed Chairman. I would be surprised if anyone were to raise similar questions about Stevens. The key difference is the RBA’s commitment to an inflation targeting regime. As it happens, the RBA’s inflation targeting framework is only very loosely defined and the associated governance framework remains thoroughly antiquated. The RBA makes up for this, however, by having articulated the relationship between policy and its inflation target. The RBA’s approach to policy is now reasonably well understood, in a way that Fed policy arguably isn’t. The RBA’s experience shows that even the most basic commitment to an inflation target can give a central bank credibility that doesn’t just walk out the door when the central bank head leaves. Glenn Stevens will be speaking on The Conduct of Monetary Policy on Thursday. Should be an interesting speech. Taking a leaf from David Altig’s regular updates of Fed funds rate probabilities, below we show the probability of a 25 bp RBA rate hike at each of the monthly post-Board meeting announcement windows. Probabilities are derived from 30 day interbank futures. These are not as liquid as 90 day bank bill futures, so bid prices are sometimes substituted for last trade prices. Only contracts for which there is currently open interest are shown. Although it is common to estimate implied probabilities from bill futures, interbank futures have the advantage of being a monthly rather than quarterly contract and there is no need to make assumptions about the (variable) premium of 90 day bill yields over the official cash rate. Note that the RBA has no regularly scheduled meeting in January. The probability for January is based on an unscheduled ‘inter-meeting’ move on the first Wednesday of January.